For several years already a new biotope direction in the aquarium design has been developing and biotope contests are held around the world. But what is the biotope, and is it correct to call aquaria biotope? The definition given to a biotope in the encyclopedia says: biotope (Greek βίος — life and τόπος — place) is part of the earth surface (land or water body) with one type of environmental conditions, occupied by a certain biocoenosis. Biocoenosis is a collection of plants, animals, microorganisms that inhabit a certain biotope. According to some aquarists it means that the organization of biotope in an aquarium in your home is not possible, since it is impossible to move to a small closed volume all the natural processes that occur in the water body, add the bacteria, the water, put the plants... 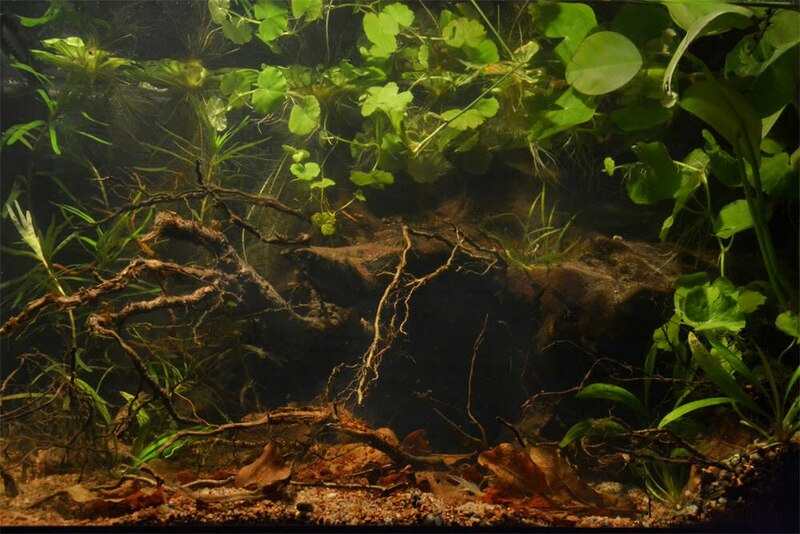 It is impossible to recreate specific river or lake in an aquarium, as you cannot combine in a small volume the processes that occur near the margins and in the deep water, because they are different and require different conditions. And skeptics conclude that without all this an aquarium can not be called biotope. 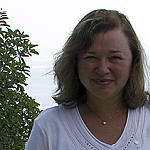 Any river or lake has many different biotopes not similar to each other. 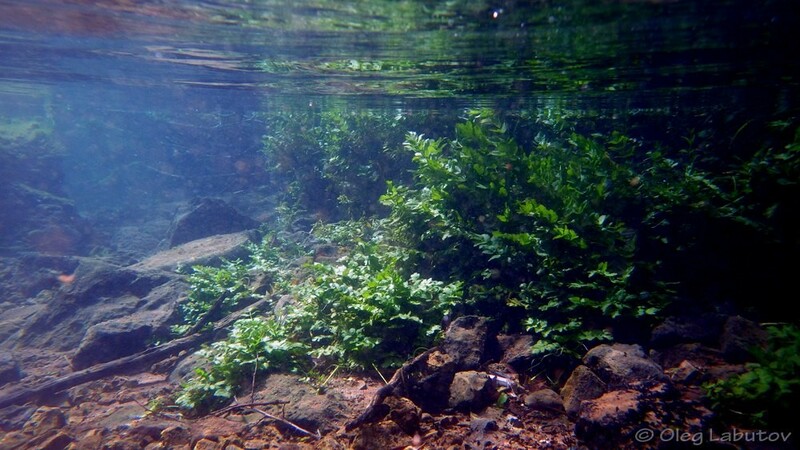 There are areas with fast flow and slow flow, there are areas densely covered with vegetation, there are places without plants at all, the bottom may be different in different parts of the water body; all this is not possible and should not be recreated in one aquarium. But you can try to simulate a small piece, like the marginal zone of the river with dense vegetation and roots of trees or muddy part of the lake with water lilies and driftwood, or a stream with fast flow and rocky bottom. May such an aquarium be called biotope? Perhaps the name is not quite correct, but Heiko Bleher introduced this concept and it is very much used in everyday life now. Therefore, we use a term biotope aquarium for an aquarium that mimics as closely as possible the natural habitat of fishes. Decor, plants, water parameters should be as close to natural ones as possible. Supporters of biotope aquaria set them up first of all for the aquatic life taking into account their needs and comfortable keeping. Under the conditions as close as possible to the natural fishes begin to show natural behavior, bright colours and, ideally, to spawn. COPYING NATURE OR CREATIVE APPROACH? From the point of view of some aquarists a biotope aquarium is ugly according to its definition and, in most cases, is a dump of driftwood, stones, leaves covered with algae and a few plants in miserable condition. And the saddest thing is that there are contest aquaria that suit this description very well. The main argument of their owners is that in the first place such aquaria are for fishes that feel perfectly in them, and only this is important. Probably for technical tanks this approach is quite well, but if an aquarium is set up for show, it should look nice! In our opinion, any public aquarium made for a contest or for a zoo or an oceanarium should not only show the habitat of fishes to the audience, but also be beautiful to bring aesthetics to people, to attract attention and to make anyone to look at it. At the same time all the needs of fishes must be taken into account: shelter, space for swimming, flow rate, lighting, water parameters. Creating a public aquarium a designer should always look for a compromise between naturalness and decorativeness. When setting up a biotope aquarium, be like an artist: a painter, a photographer or a sculptor, cutting off all unnecessary, grasp the main things and show it to your audience. Do not neglect basic rules of composition, they are the same for all types of art. If in your biotope there is nothing but rocks and driftwood, make a composition using them. If there should be leaves, use leaves, but it is most important not to make a dump of all this, do not forget about the beauty and harmony. 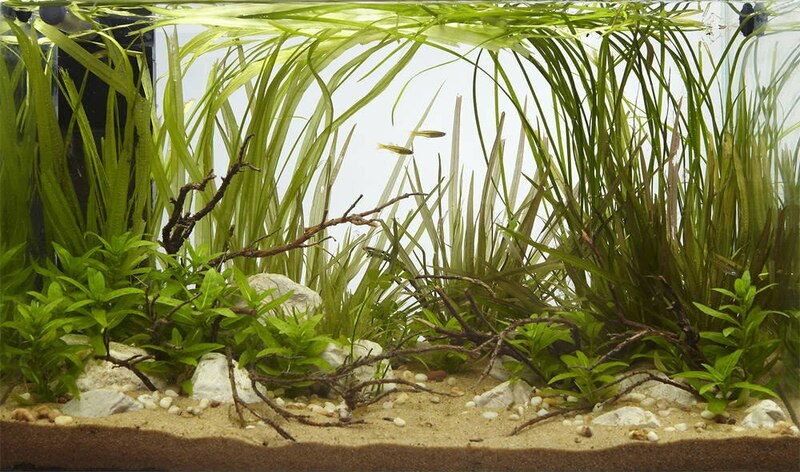 And what you should do with algae in the aquarium, they are also a part of nature? You also need to be creative with algae, and do not make a problem of them. In aquaria without plants algae can add naturalness. But in aquaria with a lot of plants they are not desirable because they spoil the appearance. It is necessary to take care of such an aquarium like any planted one, but without using such things like glutaraldehyde, because it affects the health of the fishes. Are biotope aquaria viable? Again, skeptics believe that they are not, they say any contest aquarium does not exist for a long time since it is created for a single moment of taking picture, and afterwords it will be disassembled or will degrade. In some way they are right, after taking a picture the author often loses interest in his creation, he needs to be ready for the next contest. Such an approach is common for aquascapers, but that not always happens to biotope aquaria. Biotope aquaria are often set up by aquarists that are fond of certain species of fish, long before the contest and these aquaria exist for a very long time even after the contest. We remember that people who like fishes make biotope aquarium for comfortable keeping of fishes. We also would like to note that the viability of the aquarium, first of all, is determined by how well the owner takes cares of it. Any aquarium is a living organism, which changes and evolves over time, plants grow, trimming is required, some of plants are removed, and some do not survive; decor can be replaced too. As a rule, the owner does not set a goal to maintain an aquarium in the form that was captured in the contest photo. When setting up an aquarium, it is necessary to plan maintenance immediately and to understand how much effort it may take. Especially we would like to mention, that aquaria set up for cold-water fish, usually require additional cooling of water, and they rarely exist for a long time in home. Successful aquarium brings a lot of fun to an aquarist. And there is no surprise: a piece of nature is fascinating! It connects a person with the rest of nature, reminds of it. Why is this bond necessary? 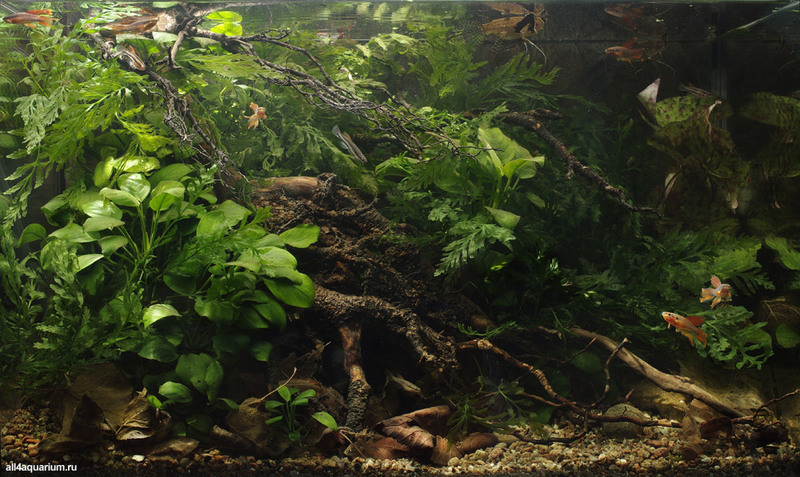 Once a simple aquarist-hobbyist asks this question, he turns into a slightly different aquarist and begins to understand the importance of this small ecosystem, made by him. What is the difference? Like in the education of children it is in understanding responsibility; the older you are and the more experience you have, the more responsible your approach to smaller ones should be. And it is in understanding that the nature is a place where we all have come from, the nature, which forces sometimes seem immense, the nature, which sense of taste is impeccable. It turns out that aquascaping and biotope direction are not so far from each other, and we can consider these two phenomena as the one in the other. As big and small, as the principle of humanity in relation to the living form and a way of making harmonious world in aquatic landscapes with an idealized perception of the artist embodied in accordance with his vision and giving the viewer a sense of admiration for the great nature. Aquascaping contests or biotope aquarium design contests help to raise the ordinary aquarist-hobbyist to a new level in the perception of the beauty of the underwater world, to push him to create much more in his aquarium than just "cute home swamp"; putting a container of water at home he should knowingly fill it with life, beauty and harmony. It turns out that the things that seemed incompatible can interpenetrate each other, and only the extreme manifestations can harm to both of them. 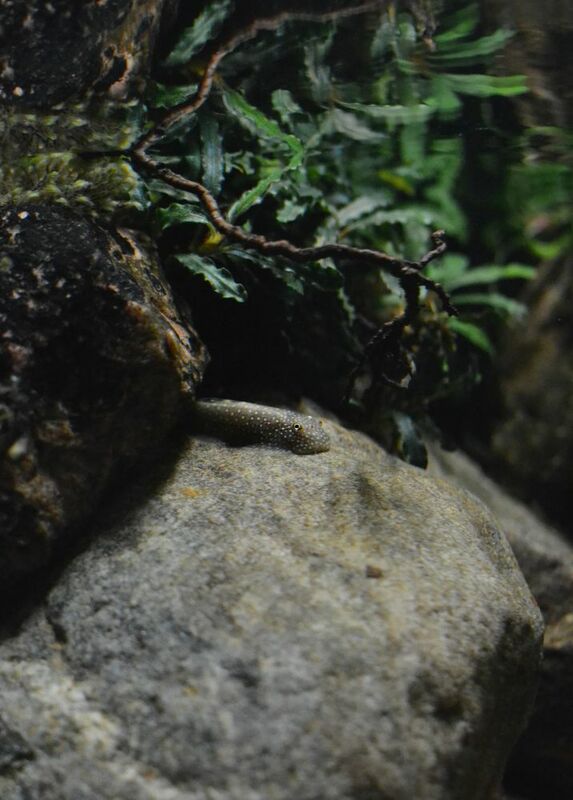 It is no need to chase the excessive naturalistic biotope, because the litter in the nature is only a link in a wise self-cleaning system, in an aquarium a gravel cleaner does this function. Man-made chaos is an example that a person is able to bring to the world both the ugliness and beauty. There is no ugliness in piled driftwood in nature, there is a rational nature, and there is an angle from which a person looks at the driftwood. Any pile of leaves is beautiful, though it is deeply rational, since it is a part of a vast mechanism of what is happening on the planet from season to season. Aquascaping also goes to extremes, because some works bring to the idea that the fish should not be put there, but only some aquatic creatures for practical purposes (such as eating hair algae, for example). It should be understood that some masterpieces of an artist already are not related to water, it is just a man-made art, painted using a palette of nature. In such cases, the very understanding of the vessel with water as fish habitat is eliminated. The massive accumulation of art can be seen in aquascaping contests. But this abundance often makes no positive cultural influence, but dilutes the spectator, who is unable to perceive at once every idea, every sacrament of creation born by the artist. Yet an aquarium is designed and should trigger a strong interest "live", then it becomes a cause and subject for personal improvement through creativity. In this regard, popular gallery of live high-quality designed aquaria with all their energy can inspire admiration of the audience for a long time. Keeping in mind the fact that the demonstration of art pushes the viewer to create his own, gives new strength and inspiration, it is aiso important to harmonize public aquaria. Looking at aquaria in zoos and oceanaria, we sadly notice how often they are far from comfortable ones for the fish. It is very sad that the principle of biotopeness is violated there so barbarically, because it should not be allowed in a place where it is seen by a mass audience, and especially by children. What respect to the feasibility and the fragility of the natural kingdom may be inspired in them? Galleries and exhibitions are obliged to signal to people: "You should not just love the nature, but also take good care of it, all of its manifestations, and in particular to its small inhabitants!" Why do so many people love their aquaria? In addition to the possibility of constant creativity, positive emotions, a piece of nature in them may affect life, leading from the routine, allowing observe a fraction of the wealth of the element from which all the people came, and on which people depend and will depend. Creation pushes to learning, and new knowledge pushes to care. This is particularly valuable, because care of aquatic creatures' lives makes a man better. Vyacheslav believes that it is better to set up biotope aquaria, if one saw these places, so he chose a local river. All decorations, rocks, moss, soil, as well as the fish were taken from the same river. When setting up the aquarium the author tried to show the beauty of nature to the audience as much as possible. Bright green moss is very beautiful in shallow clear water, it forms fine dense thickets, constantly waving in the strong current. Fishes feel quite comfortable in this aquarium, a powerful pump hidden behind the rocks provides flow. Vyacheslav tries to popularize fishes from the waters of the Far East, many of them are perfect for keeping in aquarium. The aquarium was set up specifically for the contest, so it existed not so long, and all the inhabitants and decorations were returned to their native habitat. Another example of an aquarium with all the decorations and fishes taken from the natural waterbody. Privetnaya river is a river with strong currents, cold water, sandy and rocky bottom, there is almost no vegetation here, moss grows on the rocks at the margins, where fragments of pine branches form driftwood debris under water among the boulders. 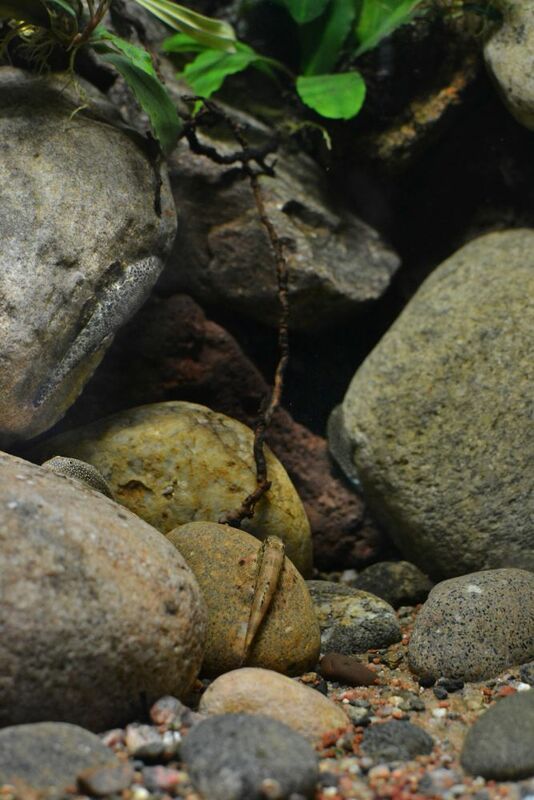 It is a typical natural chaos, which are easily reproduced in the aquarium using twigs and stones on sandy bottom. Aquaria with this approach in design are frequent in the contest, they truly represent the underwater landscape, but do not carry the aesthetics. Undoubted advantage of this work is that in the natural chaos Vera managed to find harmony and beauty. Is this aquarium viable? It contains cold-water fishes. Not without proper care, but if you maintain a strong current, well-aerated water and prevent an increase in temperature, then it may exist for a long time. Such aquaria are more suitable for zoos and oceanaria, not for home. This aquarium did not exist long, because it was difficult to keep it, all the decorations and aquatic animals were returned to their home environment. 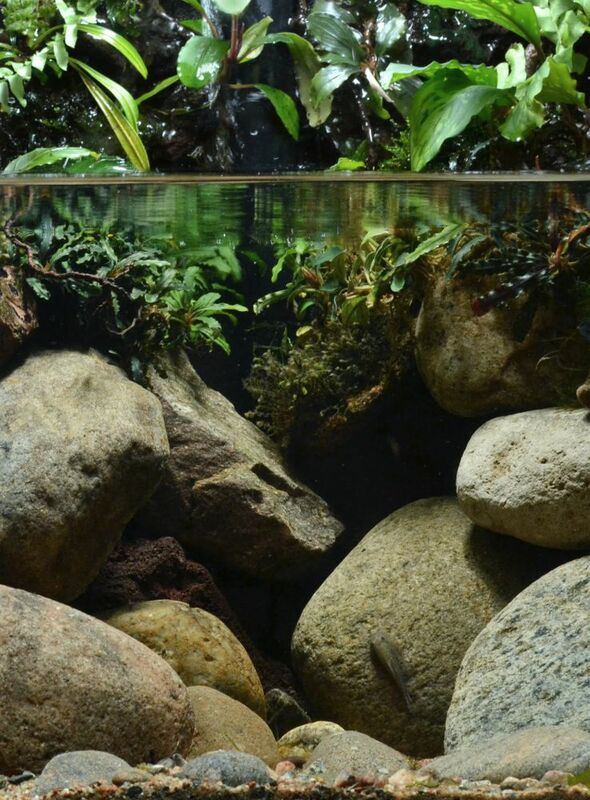 This aquarium simulates part of a river biotope where a small waterfall with Bucephalandras on the rocks is replaced by an area with moderate current, rocky bottom without any plants. How to set up a biotope aquarium with almost only stones to draw attention to it, to make people look at it, not to pass by, especially if the fish do not have bright colours? Anastasia focused on the upper part. The bottom and the back wall of the aquarium were decorated with stones, which are laid out very naturally and did not resemble Iwagumi style used in aquascape and by many aquarists, setting up rocky biotope aquaria. A powerful hang-on filter were used to simulate a waterfall, water falls on the rocks, drops hit the plants, providing comfortable conditions for them. Moss grows on the rocks located at the surface of the water. The hang-on filter is used as a phytofilter which removes nitrates completely. But we should not pay too much attention to the above-water part of the rocky biotope aquarium, it should only complement the underwater part, but not get over it. Otherwise we will get paludarium, and that's another story. The problem of creating this work was not so much in the complexity of simulation of the underwater landscape, but in finding plants that are typical for the biotope of African Lake Chad. This is a common problem that aquarists-biotopers face. There are those who, for example, believes that if you can not get appropriate plants and decorations, then you should not set up the biotope aquarium or it will not be considered as biotope. From our point of view, if you can not find native plants, it is possible to replace them with others, as long as they look like the ones that grow in the chosen biotope and preferably are from the same family. We think the fish will not find substitution, and a habitat close to their home will be created. 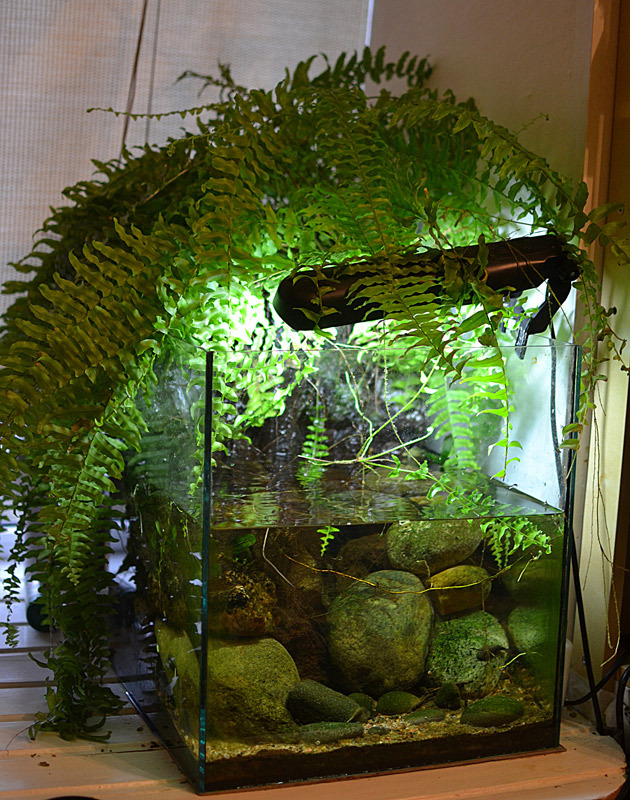 If an aquarist with such replacement sends a picture of his aquarium to a contest, it is desirable to specify in the description what kinds of plants were replaced and why. 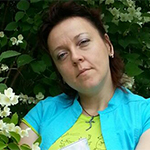 It will demonstrate knowledge of the biotope to the members of the jury. Also aquarium lighting is worth mentioning. Surface leaves of Nymphaeas cover almost the entire surface of the water, leaving small gaps. 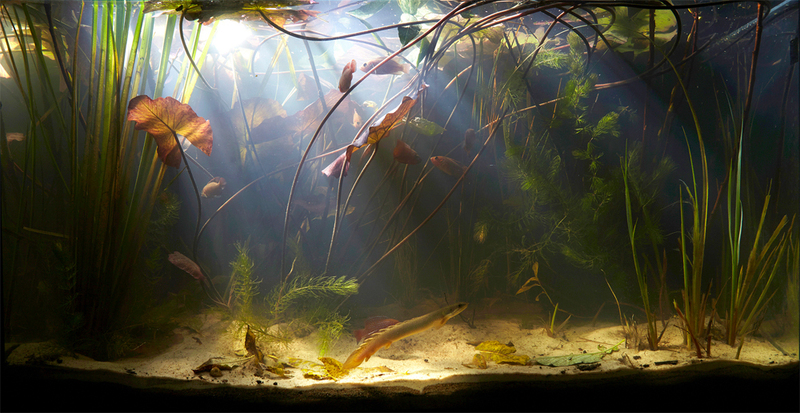 Soft light goes through them, creating a mysterious atmosphere of the underwater world in the aquarium. The aquarium probably looks more like aquascape than biotope. But in the underwater world landscapes which beauty and appearance very similar to «nature aquarium» style are not so rare. There are paths winding among the rocks and thickets of plants here, there are odd driftwood covered with moss, and in Guaporé River with crystal clear waters there are vast gardens of aquatic plants. This aquarium simulates a sunlit marginal area of the creek with sandy and rocky bottom, a slow current and aquatic plants. It is an unusually cozy and beautiful aquarium for dwarf cichlids, which are very demanding in keeping conditions. In the aquarium there is a phytofilter which ensures the absence of nitrates. The leaves on the bottom serve as a substrate for microorganisms, which, in turn, are an excellent food for fry. This is exactly the case when the leaves are essential in aquarium for a comfortable fish keeping. Nannacara anomala repeatedly spawned and took care of their fry. In this aquarium the whole life cycle of the fish from birth to death could be observed. A perfect example to show a thing that in nature, at first glance, seems to be a simple pile of driftwood and leaves. The aquarium with great composition beautifully shows the natural atmosphere. Fallen leaves add some naturalism. It is seen that the well-fed fishes with bright colours feel very comfortable. 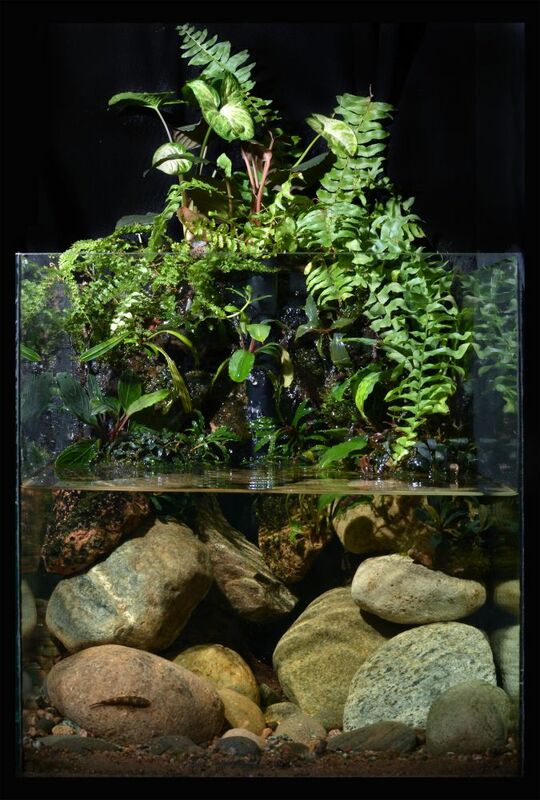 A common mistake of aquarists is a use of Anubias and Bolbitis species to simulate the African Great Lakes biotopes, but they do not grow there, they do grow in such places. 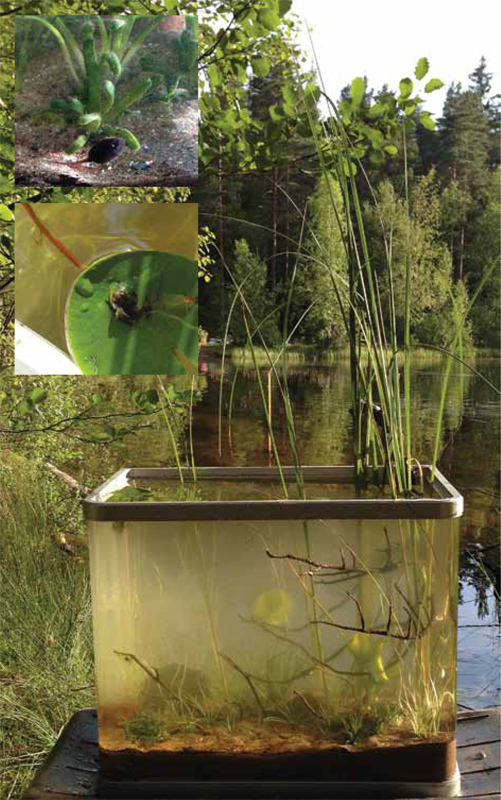 The idea to set up a biotope aquarium right on the lake came to us after watching films by Ivan Mikolji, researcher and wildlife photographer from Venezuela. The aquarium simulates the marginal area. All the decorations and plants were taken directly from the lake. Inhabitants are Cyclops, polliwogs and a small frog. Before proceeding to the designing, we (a group of enthusiasts) investigated the marginal zone of the lake, measured water parameters. The most common plant here is Lobelia dortmanna, also Isoëtes lacustris, Sagittaria sp., Nuphar lutea grow here, along the swampy margins there are Juncus sp. and Calla sp. We saw only one kind of fish: underyearlings of Perca fluviatilis. Is such an aquarium viable at home? For a while it is, if you bring water from the lake or gradually replace it by RO water, but sooner or later it will start losing its beauty. Plants from our local waterbodies need a rest period in winter, which is difficult to simulate at home. Therefore, they will gradually degrade and eventually die. Lobelia dortmanna have been tried several times to adapt to aquarium conditions, but so far without any success. This aquarium existed for one day, after which the animals went back into the lake, and the plants were planted in suburban pond. Kh - 0, Gh - 0, PO4 - 0, Ph - 5,5, NO3 - 0 in an area with clear water, NO3 - 10 in an area with silty turbid water.